Safety showers are important first aid equipment, preventing further injury due to splashes from hazardous chemicals. And while having several of these stations installed around your facility is important, it's equally important that they are easily located by your personnel. Effectively guide your workers during urgent situations by posting emergency safety signs in and around your facility. 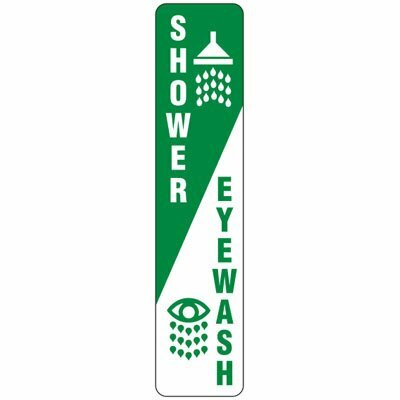 Part of Seton’s large selection of safety and first aid signs, we carry clear and concise Safety Shower Signs that you can use to lead your employees towards the nearest shower stations during emergencies. Choose between standard emergency signs or safety signs with ANSI approved headers to communicate your warning message easily and effectively. Choose protruding first aid signs for better visibility. Always maintain a high level of awareness and preparedness by setting up ample emergency stations throughout your facility. You’ll never know when accidents would happen so it’s always better keep your employees properly guided especially during emergencies. Use safety alert signs like Safety Shower Signs to help your employees find the nearest emergency shower stations. These signs come in large letter format and are made from durable materials to withstand harshest environments. Choose from a variety of signs that are pre-printed with standard wordings and universally recognized pictograms for quick recognition. Unrecognizable and improperly mounted signs can make your efforts to provide safety warnings seemingly insignificant. Make sure that your safety signs are large, conspicuous, properly installed, and easily recognizable even at a distance. Seton offers a wide variety of Emergency Safety Shower Signs that are guaranteed noticeable and can be easily understood by everyone within your facility. We also carry luminous signs that are bright and will remain visible even during a power outage. You can choose between self-adhesive vinyl signs or signs that are pre-drilled with mounting holes for fast and secure installation.